While the nation follows the Middle East conflict on network news, Army Master Sergeant Zevon has lived it. In his 18 years of military service, he's deployed nine times to war zones, each tour lasting 6 to 12 months. Zevon says, "It's an honor for me. It's an honor to do what I've done. I'm very thankful for what it's done for my family and how it's changed my life. Growing from a boy into a man." Zevon's biggest supporters are those he leaves behind, wife Ashley and his five kids. Ashley says, "Thinking about what he does over there has helped me to realize how much we take for granted. And I feel completely secure with him." Zevon adds, "I feel equally impressed proud of her for what she's done to support me through all that. All I had to do was think black and white and be tough. It's humbling to hear her say she's proud of me when I know that I couldn't have done it without her." Zevon was planning on re-enlisting, but due to troop downsizing the army declined his request. He received an honorable discharge, but only had a few months to find a civilian job. That meant cutting back on expenses. Their oldest daughter Kaylin was leaving for college. They couldn't buy everything they had planned for her dorm. And there was no money to spend the night near campus to attend orientation with Kalyin either. 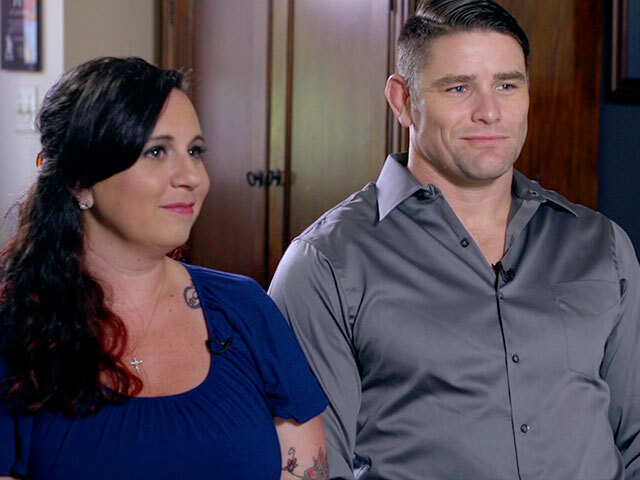 The couple trusted that God would see them through this. Ashley admits, "Having faith that this is all God's plan and He'll take care of us is probably why we're not going as crazy as we would be." The couple attends a Christian military support group just outside Fort Campbell, KY, called Force Ministries. Force heard about Helping the Home Front and asked CBN to get involved. Force executive director Greg Wark sat down with the couple to tell them the news. Greg says, "Helping the Home Front has decided to help with this transition by providing you guys with three months of mortgage payments." "I thank you so much to think that we're worthy of doing something like that for us. We thank God that He allowed this moment and allowed us this opportunity." Greg also told them CBN would help them get Kalin settled in to school. Ashley says, "We are very grateful for CBN stepping in and gifting us this." Zevon and Ashley spent the weekend near campus to attend orientation and get Kalin settled in. The family can now transition into civilian life with a little less stress. "I think it's a great program," Zevon says. "I hope it continues to help a lot of other soldiers and their families. We thank you so much. It's a huge burden that is lifted off our shoulders."